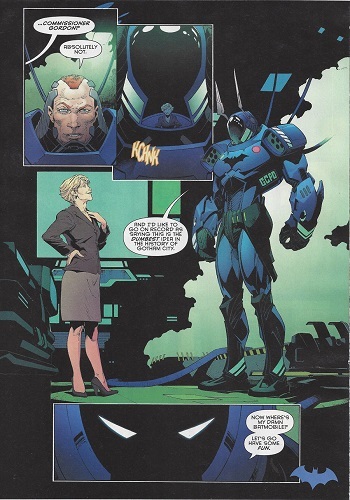 A leaked page from DC's one-shot Divergence comic has revealed the identity of Gotham's new, post-Convergence Batman. Back in March, DC Comics and Batman writer Scott Snyder revealed that they had some "huge" changes in the works for Gotham and its famed Caped Crusader. Among these would be a mechanized battle suit and, seemingly biggest of all, a new willingness to use firearms. Now, however, a leaked page from the DC one-shot Divergence has revealed probably the most shocking change of all: the new Batman will, in fact, be Commissioner James Gordon. According to the leaked page and other sources, Gordon will be taking up the mantle of the Bat as an officially funded part of the Gotham Police Department. On the page in question, Gordon, now sporting a shaved head and no mustache, is shown suiting up in his new Bat-armor. Speaking to another character he says "I'd like to go on record as saying this is the dumbest idea in the history of Gotham City." He then follows that up with "Now where's my damn Batmobile? Let's go have some fun." We should be finding out what happens to Bruce Wayne when the final issue of Batman's Endgame arc releases this month. First things first, wow does Commissioner Gordon look weird without a mustache. Moving on to the important stuff though, it would definitely seem that Snyder was telling the truth when he promised to stun readers with how deeply he planned to transform Batman. Just speaking personally, I'm not necessarily sure how I feel about trading Bruce Wayne's Batman for Commissioner Gordon as a gun-toting RoboCop. It doesn't have to be bad, of course, and if anyone's up to the task of making it good, it's Scott Snyder. Readers interested in checking out Divergence in full will be able to grab it on May 2nd as a part of Free Comic Day.